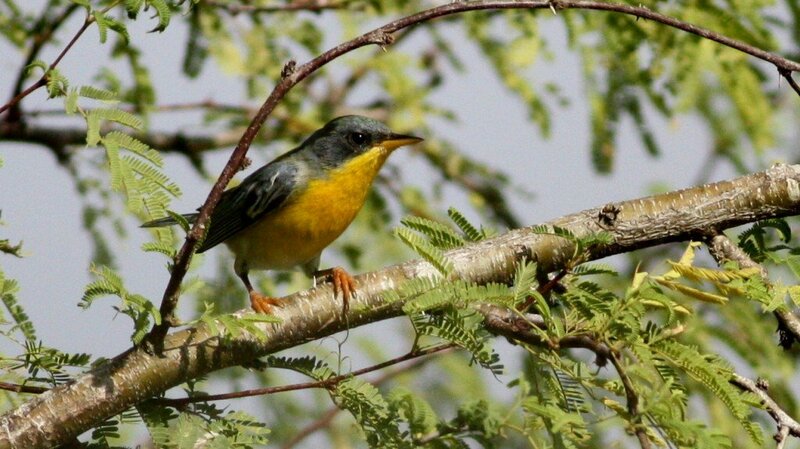 We birders birders on the eastern half of the continent are quite familiar with the ubiquitous Northern Parula, whose buzzy song is often one of the very first new birders learn because of its pervasiveness at nearly every spot in the east from mid-April on. Before the callous lumping of all those warblers into the soulless genus Setophaga (moth-eaters? yuck), the parula was the face of the family. Common, accessible, and easily identifiable with a jaunty white eyering and a dapper multi-hued breast band, the very picture of the bow-tied nerd. It was – and still is despite the unfortunate name change – the quintessential Parulid. 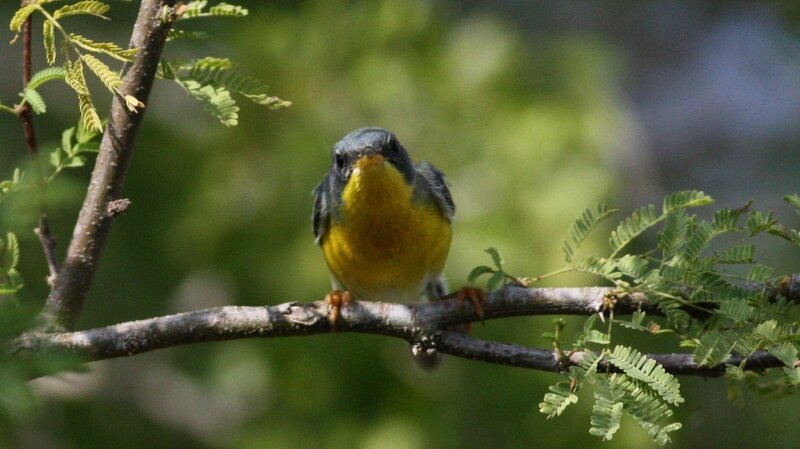 South of the border, however, there is another parula. Swarthier, with a black bandito mask and a yellow chest opened wide to the belly as if to seduce you with its neotropical charm. Where its range sneaks across the border into the southern tip of Texas, it inflames the passions of everyone who would gaze upon it. 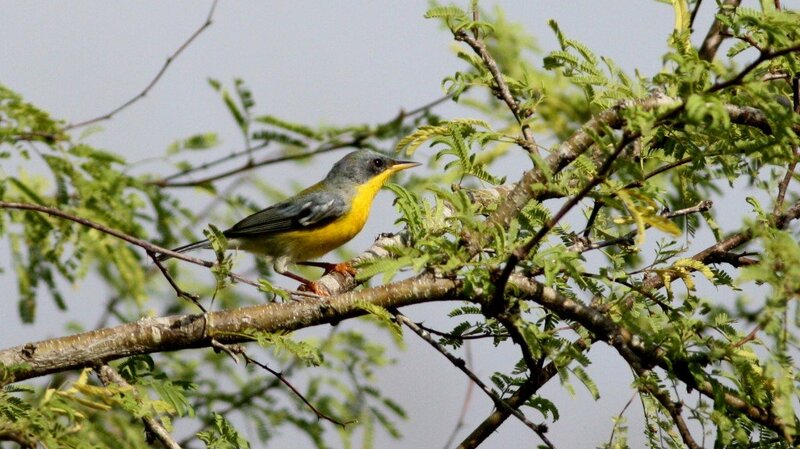 And you cannot resist it, this Parula pitiayumi, this Tropical Parula. 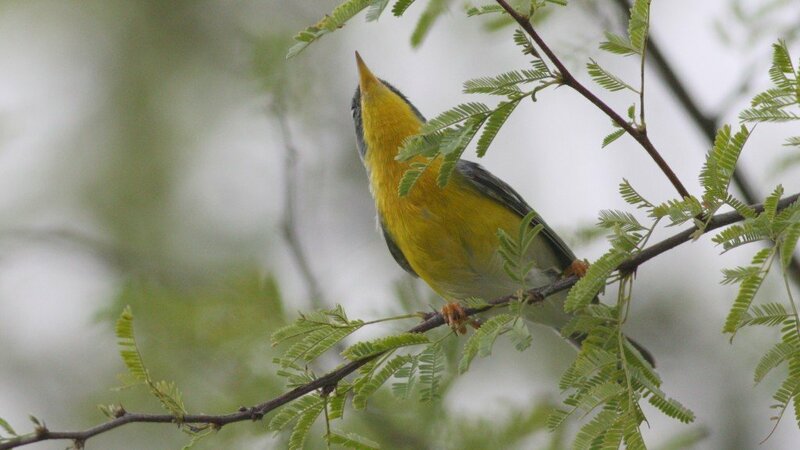 While in the Rio Grande Valley last month, taking part in the most excellent Rio Grande Valley Birding Festival, the rumor that the world’s most accommodating Tropical Parula had been reported at the Visitor’s Center at Laguna Atascosa NWR in Cameron County, Texas. When I met up with my friend Christopher Ciccone of Picus Blog that morning to decide what we wanted to do that day, I knew where I wanted to go. For me, it was Tropical Parula or bust. See, Tropical Parula is something of a totem bird for me. Back in my nascent days of birding, I used to travel to the Rio Grande Valley every single spring break with my family to visit my grandparents, who were part-time residents known by the natives as “Snowbirds”. My time in the Valley was a huge catalyst for my birding career, something about seeing Chachalacas and Green Jays will do that for you, and by the time I was birding really seriously (around 1994), I was spending a lot of time planning these trips to maximize the time spent picking up as many amazing bird species as I could. From some older birders in my local club I learned about something called the “Rare Bird Alert”, a phone number that you’d call and listen to an answering machine message that would lay out all the notable rarities that were being seen in the area and where you could find them. The week before our annual trip, I learned that a Tropical Parula was being seen at a roadside reststop near the tiny town of Sarita, Texas. I needled my parents to make plans to go out of our way to find it. My dad, being a birder too, was an easy sell. And since he was driving, we made the detour. I saw that Tropical Parula, two of them to be exact, nearly as soon as we got out of the van. It was a life bird, but being a young birder, I was nearly as impressed with the other life birds I snagged at the same stop. The Summer Tanager and the Blue-headed (then Solitary) Vireo and the Hooded Oriole. The memory of those first Tropical Parulas faded away until, in my mind, all I can remember is a flash of yellow in an acacia tree. The possibility to get that bird back in my brain was one I couldn’t resist. So Christopher and his wife and I pulled into the parking lot to see a field trip group standing around, clearly coming off a Parula high, and helpfully pointing that the bird went, “over there”. So we stood and waited. And walked around the building and waited. And eventually I went inside to get a candy bar and, on my way out, paused to smirk at the recent sightings list where TROPICAL PARULA was written multiple times with multiple frustrating exclamation points before exciting only to see a frantic Christopher waving his arms and stage whispering, “Get. The. #%@&. Over. Here. Now”. There, right in the tree in which it was supposed to be, was the world’s most accommodating Tropical Parula. We ended up having to walk away from it. Now that’s how you recharge a memory. Awesome! Loved the way you tied your first experience in with the new. Exhilarating. I love the idea of “recharging memories”. It is nearly as good as seeing something for the first time. Fabulous story…!!! Great photos too…TFS!!! Cool post Nate! This is special bird to me as well… when I lived in Ecuador one used to attack its reflection in the window every morning! Crazy how different this Ecuadorean looks compared to your Texan. Where Are You Birding This First Weekend of September 2012? Where Are You Birding This First Weekend of October 2011?